On June 22, 2010 TNT brings a unique collector sheet from which all five cities of the Netherlands in 2010 Beautiful series come together in a new arrangement. Besides the stamp TNT brings First day Cover, and Prestige stamp booklet. The collector sheet is widely available and is the only one of the series included in the annual collection of Dutch stamps of 2010. 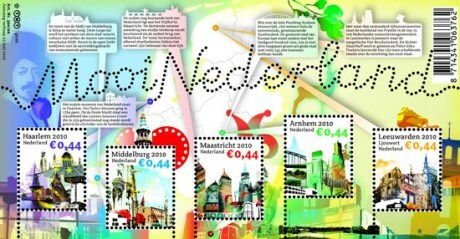 The other stamp sheets Beautiful Netherlands 2010 are only available in the places from which they were ordained by the Club Collect TNT Post. Some 45 Dutch cities have been put in the the limelight in the series Beautiful Netherlands since 2005, Den Helder to Maastricht and Groningen to Middelburg. Cities with inspiring modern architecture, appealing historic buildings, high-profile artists, lavish feasts and unique sporting events. It’s all here on the stamp sheets in the series Beautiful Netherlands. In 2010, another five provincial capitals have been given their own postage stamp. These towns include: Haarlem, Middelburg, Arnhem, Maastricht, Leeuwarden. Here is my very own Beautiful Netherlands (Mooi Nederland) Collector Sheet, issued on 22 June, 2010. I bought four of them so I can trade with a few of my friends. Sale: The stamps are while stocks last, available at the Club Collect in Groningen, via the online store www.tntpost.nl / collectable club and mainstream outlets. The validity of the stamps for postage is undetermined.